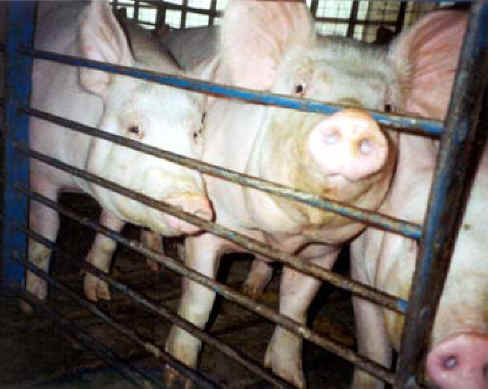 (Pig Exploitation - Factory Farming - 04) Pigs who are raised on factory farms, like these, are confined in metal and concrete pens with hard slatted flooring. They live here until they reach slaughter weight of 250 pounds at six months of age. Please have some compassion for these fellow living souls! Don't eat them! Tell other people why you're no longer eating pork, ham, bacon, and other products that come from animals.